Big Bang’s design will certainly remind you of the event that gave our universe the start that it needed, with beautiful images of planets and stars being shown in its symbols. The slot offers some interesting features inside, which help make it a lot more fun, including here multipliers of up to 32x and wilds. This slot is one of the designs from Net Ent and it has 5 reels, 25 bet lines and paying up to $32,000. The action takes place in space, as it should be in such a title. You can see the universe in the background, a gorgeous image, the kind that NASA might release to the public, taken from one of their telescopes. On the reels, you see either images of planets, moons and stars from up close, or playing cards with pretty lights behind them. The betting options aren’t as generous this time, with the bet level reaching 4 (4 coins per line) and with the denomination of the coins being at $0.50. You get to spend at most $2 per line, or $50 total for all of them. All these options are found at the bottom, and with the exception of the number of lines you can change them as needed, within the given range. 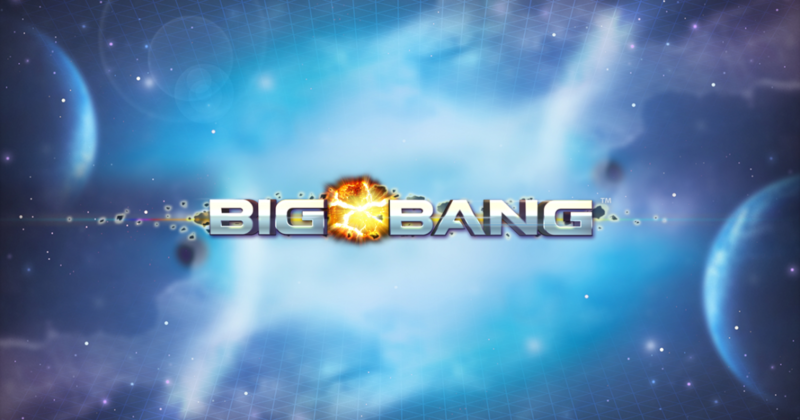 There are two features in Big Bang, a wild and a multiplier, and they are not working together. The wild symbol is the easiest one to explain, a simple feature which is capable of substituting for any other symbol that appears in this slot machine. There are no exceptions, as there are no other symbols that have special abilities. The more interesting feature is called a Multiplier Meter. You see it on the left side of the screen, present all the time. It is influenced by the number of consecutive wins that you get from your paid spins. You start off at 1x for the first win, but the second spin with a win will give you a 2x multiplier. The third one will offer prizes at 4x the usual value, the fourth one at 8x, the fifth at 16x and the sixth one at 32x. All these spins with wins in them have to come in one after the other. If there is a spin that doesn’t have a win, the meter resets to 1x and you have to start over. That multiplier meter feature is the part that looks most interesting, along with the design. In many ways the game is a bit too simple though.